Anonymous author of a small apologetic work of the seventeenth century, written in Spanish, which Grätz erroneously considers to be pseudepigraphic. 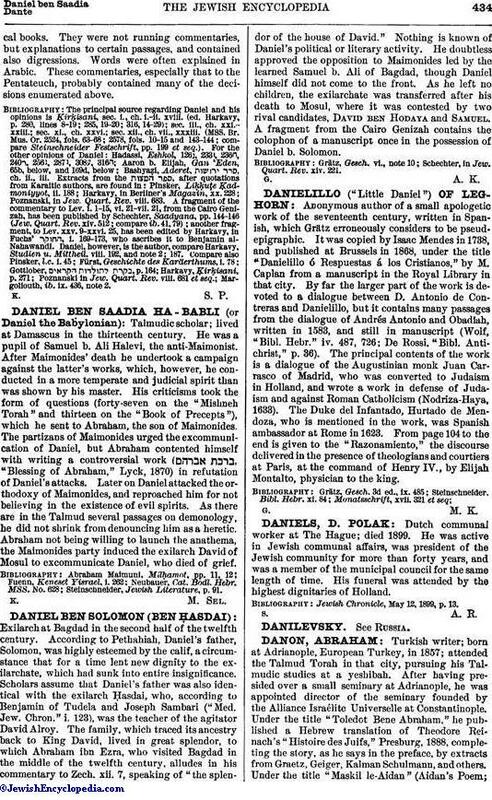 It was copied by Isaac Mendes in 1738, and published at Brussels in 1868, under the title "Danielillo ó Respuestas á los Cristianos," by M. Caplan from a manuscript in the Royal Library in that city. By far the larger part of the work is devoted to a dialogue between D. Antonio de Contreras and Danielillo, but it contains many passages from the dialogue of Andrés Antonio and Obadiah, written in 1583, and still in manuscript (Wolf, "Bibl. Hebr." iv. 487, 726, De Rossi, "Bibl. Antichrist," p. 36). The principal contents of the work is a dialogue of the Augustinian monk Juan Carrasco of Madrid, who was converted to Judaism in Holland, and wrote a work in defense of Judaism and against Roman Catholicism (Nodriza-Haya, 1633). The Duke del Infantado, Hurtado de Mendoza, who is mentioned in the work, was Spanish ambassador at Rome in 1623. From page 104 to the end is given to the "Razonamiento," the discourse delivered in the presence of theologians and courtiers at Paris, at the command of Henry IV., by Elijah Montalto, physician to the king.